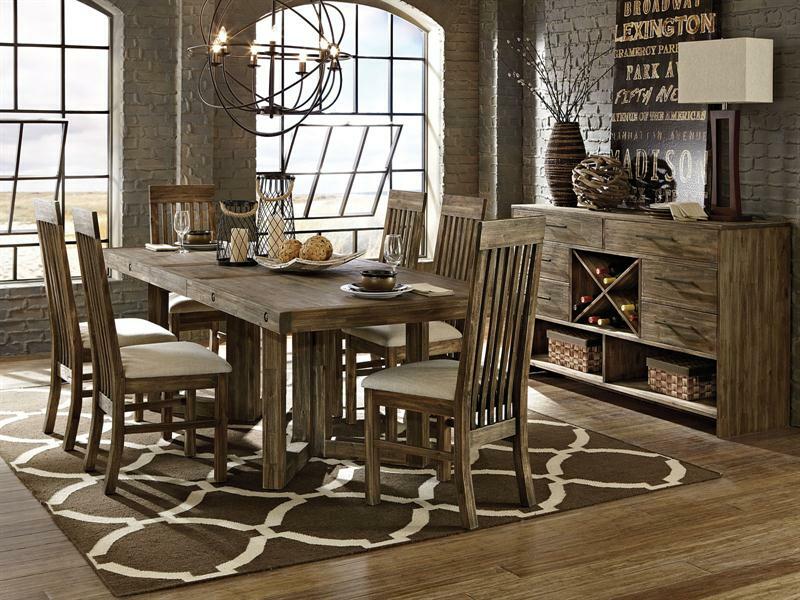 Featuring a unique taupe wire brushed finish with warm wood undertones, the Adler Dining Collection will be at home in all sophisticated casual lifestyles. With ample storage for wine and hanging stemware, and modern amenities like felt lined top drawers and LED lighting, the buffet and hutch lends convenient function to your dining room. 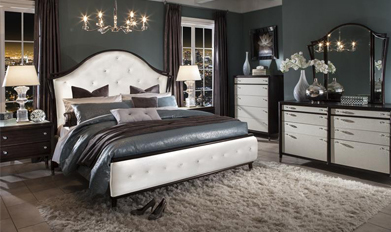 Acacia solids accented with gun metal hardware give a modern feel that says "relax, hangout, and laugh!" your right at home. All pieces are constructed of acacia veneer over acacia solids. All drawers are tinted with French dovetailing in front, English in back. Sanded and sealed drawer interiors. Curio features 1 LED light, 4 adjustable wood framed glass shelves behind 2 wood framed glass doors; plate V-groove on shelves. Buffet features felt lined top drawers; 6 drawers; side mount ball bearing metal guides; 1 silver tray on left hand facing top drawer; wine storage rack for 24 bottles of wine; levelers. Sideboard features felt-lined top drawers; 5 drawers; side mount ball bearing metal guides; 1 silverware tray on left hand facing top drawer; 1 wood shelf behind wood framed sliding flass door; tempered glass; and levelers. Rectangular Dining tables features 1-20" regular center leaf insert on gear mechanism. All chairs shipped with KD construction.